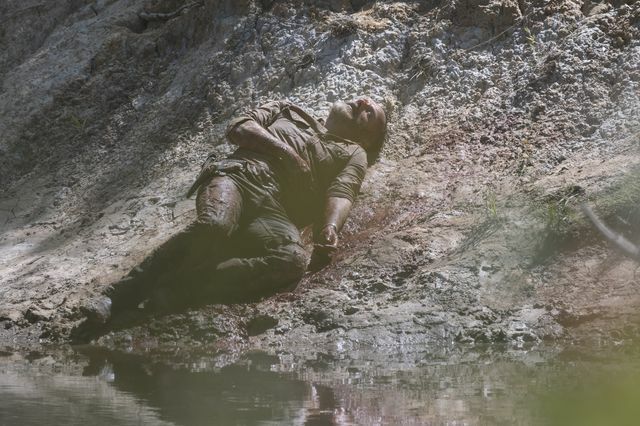 In the latest episode of The Walking Dead, Rick (Andrew Lincoln) found himself in an impossible situation and did his best to keep his friends safe. At the start of the episode we were treated to a scene in what looked to be a hospital room. Rick stood over what appeared to be a younger version of himself from the first season in a hospital bed. Outside a large flock of birds filled the sky before flying toward Rick and turning into helicopters. The action switched back to the predicament Rick found himself in at the end of the last episode. He was thrown from his horse and impaled on a rebar as two massive herds of walkers merged just seconds away. Rick was understandably in agony but knew he had to act fast. He spied more bars above him but couldn’t quite reach. Quickly he removed his belt, hooked it over the bars above and somehow managed to pull himself free. He collapsed momentarily before dragging himself to his horse. Somehow he found the strength to climb into the saddle and began to slowly lead the walkers away. Losing blood fast from his wound he began to become delirious but tried to focus on the task at hand – to keep his friends safe. He eventually came to a mailbox and rode ahead to the house creating a gap between himself and the walkers to buy himself some time. Inside he spotted the dead bodies of the previous residents who appeared to have died in a hail of bullets. Rick grabbed a blanket and tore off a strip which he tied around himself to slow the blood leaking from his side. 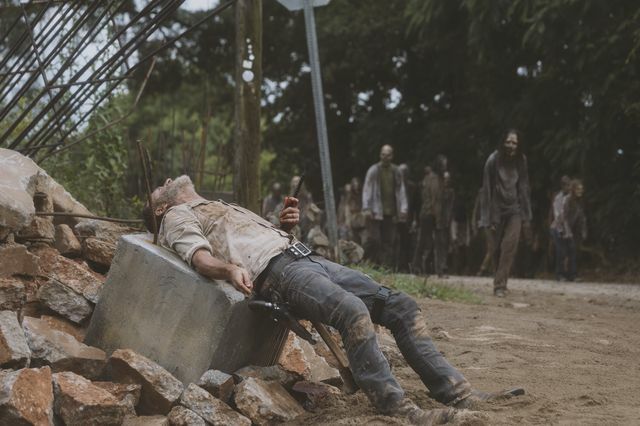 Slipping out of consciousness, Rick saw himself riding his horse, with walkers following behind, towards Atlanta in a scene from the first season. The hallucination changed to Rick and his old partner Shane (Jon Bernthal) sat in their police car eating takeaway like in their first scene. The pair traded banter and Shane pointed out that Judith was his child. Rick apologised for killing him but Shane said not to worry about it. He called upon Rick to dig deep and find his rage again. Suddenly Shane screamed at Rick to wake up and he did so. He found a walker about to pounce on him and quickly got up, making his escape by smashing through some wooden boards. Rick got back to his horse and just managed to get away again. Meanwhile, Maggie (Lauren Cohan) made her way to Alexandria with her plan to kill Negan (Jeffrey Dean Morgan), stopping to bludgeon a walker to death with her crowbar on the way. Once there she found Michonne (Danai Gurira) guarding Negan’s cell and waiting for her. The pair argued about the right thing to do and eventually Michonne gave Maggie the keys. Maggie went inside fully expecting to kill Negan and immediately ordered him to his knees. Instead Negan stood and taunted her about how much fun he had killing Glenn. Maggie dragged him out of the cell and saw his tears. He begged her to kill him so he could be with his wife. Maggie said he was worse than dead and locked him back up. Back outside, Maggie and Michonne were alerted to something going down at the bridge camp. Back to Rick, he was still leading the walkers away but in a pretty bad state. He passed out on the back of his horse and had a different vision. This time he was stood talking with Hershel (Scott Wilson). Rick tried to apologise for everything that happened but Hershel was having none of it. He said that Maggie was strong and that his grandson would only make her stronger. 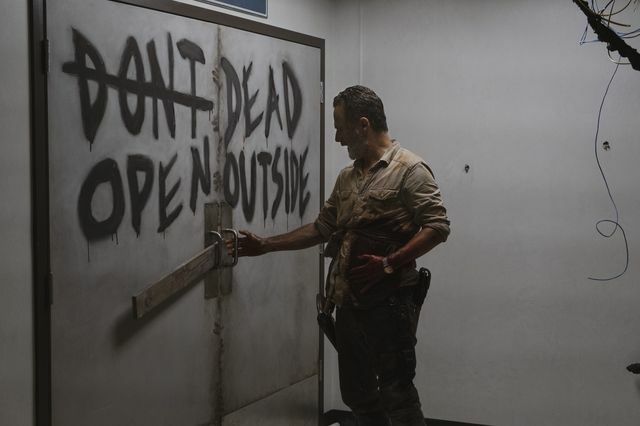 Rick’s next vision took him back to the hospital where he awoke in the first season. He opened doors that warned of dead inside to the sound of walkers. As he opened them a bright light shone through and he found himself stood with the dead bodies of all the people he knew. This vision featured Sasha (Sonequa Martin-Green) who told him that ‘Little things end, but it’s not the end of everything’ she also told him that he and his family weren’t lost. This time Rick awoke as he fell off his horse and hit the ground hard. He’d made it back to the bridge camp and the walkers weren’t far behind. It suddenly became clear that his plan was to collapse the bridge with the weight of the walkers. He struggled on with the walkers closing in and suddenly Daryl (Norman Reedus), Michonne and the rest of his friends appeared. They began to kill the walkers and Michonne gave Rick a pep talk. It turns out that this was just a vision too. Rick pushed on across the bridge and made it to his intended destination. However, while the walkers were just where he wanted them, the bridge held. A walker came close and died from an arrow to the head. Across the bridge Daryl, Michonne and everyone had arrived for real this time. They frantically tried to get to Rick and he grabbed his hatchet and took out a walker. Rick realised the herd was too big and tried to get his friends to stay back. A crate on the bridge fell and revealed it was full of dynamite. Rick took the opportunity, grabbed his pistol and fired. The bridge exploded, many walkers burst into flames and tumbled into the rushing water as it collapsed. Rick was nowhere to be seen and Daryl and the others burst into tears. Michonne was understandably uncontrollable with grief. Nearby, Anne/Jadis (Pollyanna McIntosh) saw the smoke from the bridge as she was waiting for the mysterious helicopter people to arrive. She had lied to them about ‘Having an A’ (we still don’t know what that means) and had a gun at the ready. As the helicopter arrived she spotted something on the bank of the river, it was Rick! She grabbed her walkie and told the helicopter crew that she now had a B, not an A. She wanted to return the favour to Rick for saving her life. The next scene showed her and Rick in the helicopter, he was on an IV and still alive. The helicopter flew away into the distance. This is apparently Andrew Lincoln’s last episode on The Walking Dead but he is set to return in three films to explore the character of Rick Grimes further! At the end of the episode, a whole new group of people – Magna, Yumiko, Luke, Connie and Kelly were shown. They were in the same location as where the helicopter left and fighting for their lives as walkers approached on all sides. 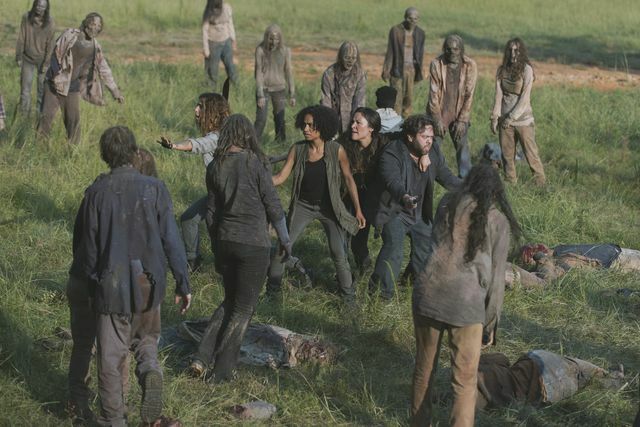 Shots rang out from the trees, killing some of the walkers, and a young girl called for them to run. The group fled to the woods and came across the girl. She had part-braided hair, a samurai sword on her back, a familiar looking revolver and placed a brown cowboy hat on her head. 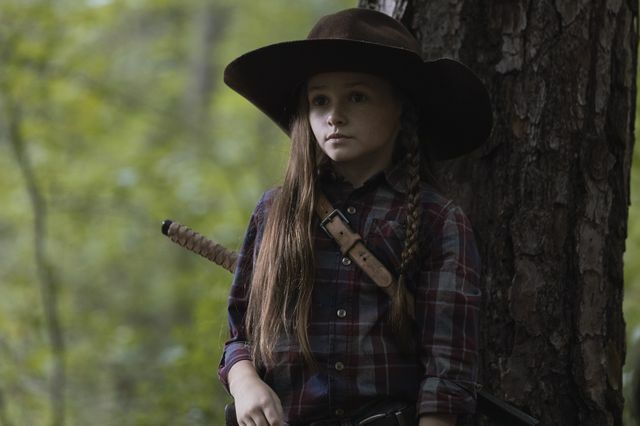 She told them her name was Judith Grimes! Things just got really interesting as it seems we’ve had around a six-year time jump! Can’t wait for the next episode? 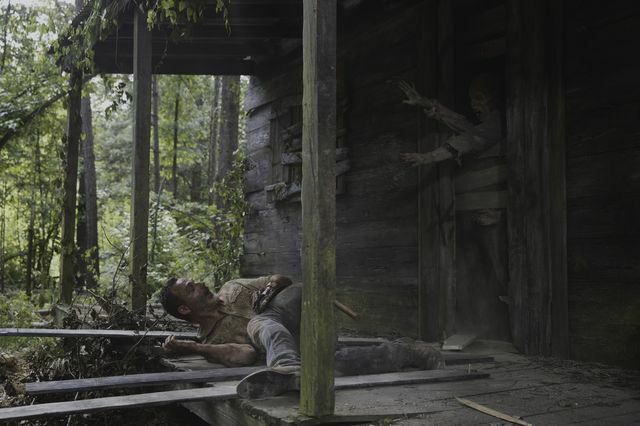 Check out our preview of The Walking Dead – 9×06 Who Are You Now?